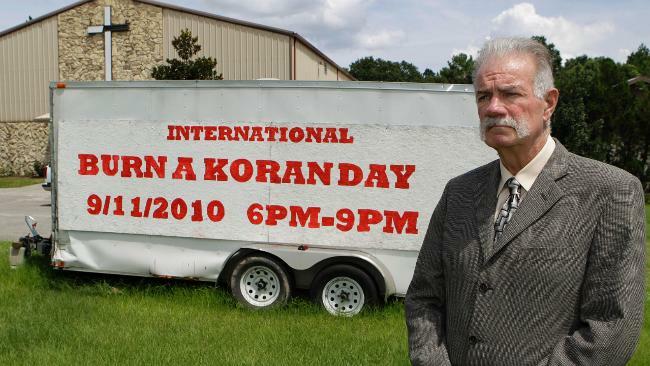 As the ninth anniversary of 9/11 drew near, an obscure 58-year-old Southern preacher with a broad gray Borat mustache suddenly earned his fifteen minutes of fame. Who is this unorthodox holy man, and why should we care about him? Rev. Terry Jones, not to be confused with the jolly Monty Python trouper of the same name, is pastor of the Dove World Outreach Center in Gainesville, Florida. His congregation currently includes roughly fifty fundamentalist Christian souls, a number he’d presumably like to increase. A former high school classmate of radio pundit Rush Limbaugh, Pastor Jones garnered worldwide attention this past week for threatening to stage a “Burn a Koran Day” on his church property. The bonfire, scheduled for the anniversary of 9/11, was intended to call attention to Bible burnings and other outrages perpetrated by Islamists against Western Christendom. No less a personage than General David Petraeus called upon Rev. Jones to cease and desist. President Obama added his two cents with an appeal to Jones’s “better angels.” And as of September 9, it appeared that the embattled Florida preacher was ready to call off the scheduled conflagration… for about half an hour, it seemed. Apparently Pastor Jones had been made to understand that if he called off the Koran burning, Imam Feisal Abdul Rauf of “Ground Zero mosque” fame would move his planned community center to a more agreeable location. Jones was misinformed. So now the word is that he’s reconsidering his decision to spare the Koran. The suspense is building, and we’ll all find out soon enough whether he pulled off his incendiary stunt. What does The New Moderate think about Pastor Jones and the Koran controversy? It’s complicated. For one, the law entitles anyone in the U.S. to burn books they own, as long as they burn them in accordance with local ordinances that govern bonfires and similar matters. If the Gainesville authorities give him the green light, Pastor Jones can ignite Mohammed’s holy scriptures freely and lawfully. Should Pastor Jones have the right to ignite those Korans in a country that famously protects all faiths? A tough question, but again I’d have to answer yes. His action would be offensive, ignorant and politically incorrect to the third or fourth power, but he’s still entitled to express his contempt for Islam’s holy book. It doesn’t even matter that the Koran actually contains numerous horrific verses that are worthy of our contempt. (So does our Holy Bible, if you read between the passages usually quoted in church. Those ancient scriptures aren’t exactly models of gentility.) The larger point is that a free nation simply can’t restrict the rights of its citizens to express their opinions, no matter how objectionable those opinions might be. But shouldn’t we recognize a boundary between protected free speech and offensive excess? Yes, we should… though that boundary is hazy and difficult to define. I’d cite the deplorable, borderline-insane tactics of Westboro Baptist Church as Exhibit A — a classic example of free speech carried to an objectionable and legally unjustifiable extreme. This crackpot congregation, denounced even by the late Rev. Jerry Falwell, has made a sick sport of traveling around the U.S. to picket the funerals of American servicemen killed in Iraq and Afghanistan. Rev. 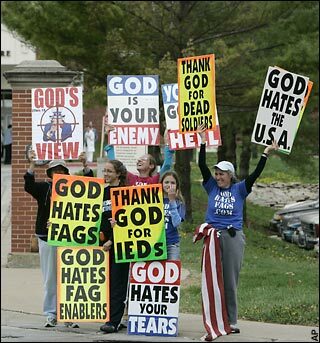 Fred Phelps and his extended family aren’t protesting the war, mind you; they’re holding placards that read “Thank God for Dead Soldiers” and “God Hates Fags.” Why? Their demented logic runs something like this: a decadent America condones the “sin” of homosexuality… American soldiers fight to defend America… therefore, American soldiers are defending homosexuality and deserve not only to die but to have their funerals disrupted. If the folks from Westboro Baptist Church ever picketed the funeral of somebody I loved, chances are I’d grab their placards and use them to administer a few sharp whacks upside the head — consequences be damned. But wouldn’t I be interfering with their freedom of speech and their right to peaceful assembly? Apparently so — even if I withheld the cudgeling and merely sued them for the infliction of emotional distress. That’s precisely what happened to Albert Snyder, the father of a serviceman whose funeral was picketed by the Westboro mob. Initially awarded $11 million in damages, he was forced by a Circuit Court of Appeals to forfeit the money and (here’s the real outrage) pay Westboro $16,510.80 in legal fees. (I have to wonder if the 80 cents was supposed to cover Rev. Phelps’ purchase of pork cracklings from a court vending machine.) The case is going to the Supreme Court this fall, so the final word has yet to be pronounced. In case you don’t have the patience to wait for the Supreme Court decision, here’s my final word: Picketing a funeral — especially the funeral of someone who died much too young in the service of his country — ranks among the most atrocious and unconscionable invasions of privacy that I can imagine. Families have a right to grieve in peace, and that right should trump the desire of any group — demented or otherwise — to express its opinion in public. True to their idiot–provocateur image, the folks at Westboro Baptist Church are threatening to burn the Koran on 9/11 if Pastor Jones decides not to stage his own bonfire. I have a feeling they’ll burn those books even if Pastor Jones does stage his bonfire. As one of my friends recently noted, burning books is an incremental advance over the medieval Christian practice of burning people — but we still have a long way to go. America’s Islamophobic crackpots are angry and determined — almost as angry and determined as the Islamist jihadists they revile. I can understand the Islamophobes’ anger and determination, especially on the anniversary of 9/11. These American radicals feel we’re too soft on a religion that seems to detest infidels even more than it loves Allah. But we can’t return hate with hate and expect the Muslim world to hate us less. NEWS UPDATE: Rev. Terry Jones has announced that he’s officially canceling his scheduled “Burn a Koran Day.” Read the story here. ← Feeding Frenzy Over Brewer’s Brain Freeze: Arizona Governor Goes Silent! Rick — another great article. You seem to be the voice of reason on here!!! Terry Jones is definitely a nut job, but I do not get the Westboro church’s irrational thinking at all. I can only imagine the hatred that is preached in that church. Makes me sick. Thanks, Kathy. Westboro is really a hate group that happens to occupy a Christian church. Apparently it’s a tiny congregation — not much bigger than the pastor’s own family. But boy, they get around. They spend hundreds of thousands each year traveling around the country to picket those funerals. I don’t know where their money comes from; maybe one of them won the lottery. It’s hard to get a grasp of their demented philosophy, but it seems they believe that God hates everybody in the world except them. It probably boosts their self-esteem. Isn’t this sounding suspiciously like an internet forum? 9/11 happened 9 years ago, and somehow it’s still big deal. All of it is like a message to all suicide bombers saying, “See, it’s worth it! Years from now the Americans will remember your deeds!”. How motivating. shiroi: Interesting point, though the sudden loss of 3000 innocent lives is nothing to sneeze at. Americans have had it easy in the sense that we hadn’t experienced a massive loss of life on our soil since the Civil War. We probably did more than our share of plaintive bleating after 9/11 and you’re right that the jihadists whoop with joy when we still lament our loss nine years later. But you know, the jihadists will whoop no matter what we do. I was thinking of the notorious “Ground Zero mosque.” If we continue to protest the mosque, we’ll anger the Islamist radicals. If we let them build it, the radicals will note triumphantly that the U.S. has lost its will. Damned if we do, damned if we don’t. It’s sad to see that the humanity did not emotionally evolve (in regard to religion) too much since Dark Ages. At that time it was manipulation of religious leaders to drive masses to kill themselves over religious issues, now is the same thing. What religious sickos do not understand today, is that no matter how many Bibles or Quarans we burn there always will be some copies somewhere. Then what’s the use of burning papers? To show that you hate a symbol? But the same act of burning to show hate, will show martyrdom for the book in cause and afterward martyrdom for the victims who fight to defend their religious views. I know that a dying for a cause doesn’t make the cause worthwhile or even true, but a lot of people do know know that. And because of that, the dangerous religious circus continues. Islam is on the same path that Christians had in the Dark Ages, St. Bartholomews’ nigh massacre, and then it will be “modernized” to the standards of the free world. Islam was not yet “baptized” with a “modern” view for it was isolated far from modern word. Now it surfaces as a primitive and intolerant religion as Christianism was. All I wish is that this “passage” from intolerant primitiveness to modern or moderate practice won’t ask for too much time or too many victims. Valdo: It’s interesting that Islam is now about 1400 years old. When Christianity was 1400 years old, the Church was still burning heretics at the stake. Maybe it takes about 1800 years for a religion to evolve to the point where it actually promotes humane values. If so, we’re in for another 400 years of Islamic fanaticism (though you’d think modern mass communications would help speed things up a bit). God help us (if there IS a god). Rick wrote: God help us (if there IS a god). You’ve got no idea how much time I’ve been looking for something like this.